The colonial hospitals of Central and Southern Africa are an important space to analyse, among other things, the experiences of the white working women who toiled day and night to provide medical and nursing care to African and European patients. This blog considers the case of colonial Zimbabwe (Southern Rhodesia), which had three types of hospitals: first, mission hospitals, under the control of various denominations and based mainly in rural areas, provided medical services to Africans in the vicinity of the mission station; second, mining hospitals, again located in rural areas, provided medical care to mine workers; and third, government hospitals, the majority of which were located in urban areas. By the 1930s and into the 1940s, government hospitals existed in major towns such as Salisbury (now Harare), the capital, as well as Bulawayo, Umtali (Mutare), Gwelo (Gwelo) and Fort Victoria (Masvingo). These hospitals employed the largest number of white nurses in Central Africa, on both a permanent and temporary basis. 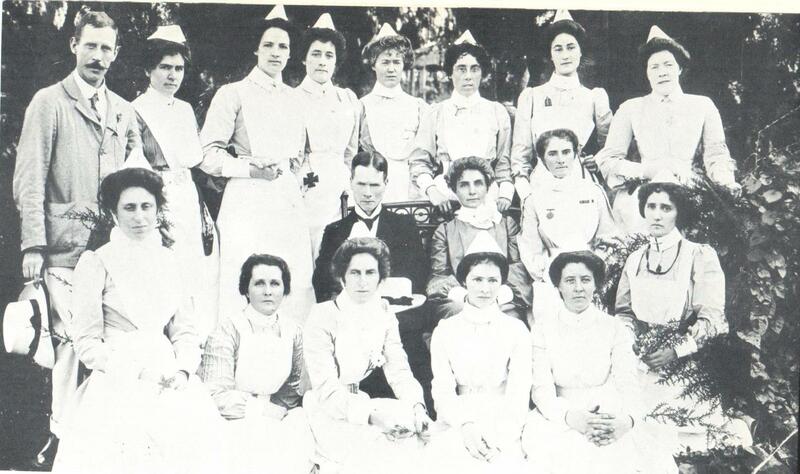 Pioneer white nurses in Southern Rhodesia: Bulawayo Memorial Hospital Staff in 1903. Miss E. Fuller, the Matron, is seen in the centre of the group. Image via the National Archives of Zimbabwe. Located in Central Africa between the Zambezi and Limpopo rivers, the land that became known as Southern Rhodesia was occupied by the British South Africa Company under Cecil John Rhodes in 1890. Rhodesia was a British settler colony whose main characteristics were land seizures, white settlement, segregated colonial governance, and economic and social privileges for the white community. The nation gained independence from Britain in 1980. Analysing archival material from the Southern Rhodesia Nurses Association and oral and written evidence provided by nurses and hospital administrators to the government-appointed National Health Services Commission (1945), it becomes clear that the Southern Rhodesian Nursing Services experienced numerous challenges that had an adverse effect on the daily work of the nurses working in government hospitals. Archival material points to their frustrations with nurse shortages, increased workloads and low salaries. At the same time, one gets an idea of how these nurses responded to the challenges they were facing. Nurses actively shaped colonial nursing policy in Southern Rhodesia by the time of World War II. This blog will focus on what is termed State Registered Nursing (SRN). Up to the 1950s when the Rhodesian government began training non-white SRNs, the SRN category was reserved for white women. Of course, the idea of reserving professions to certain racial groups during the colonial period in Central and Southern Africa was a product of the prevailing imperial ideology as well as internal colonial and racist policies. In colonial Zimbabwe, just as in neighbouring South Africa, nursing was constructed as white women’s burden in support of the imperial project. The idea of emphasising nursing as a contribution to the development of the colony was buttressed through deliberate racist policies which made it very difficult, if not impossible for non-whites to enter the profession as SRNs. However, in colonial Zimbabwe, this situation changed in the 1950s. This was a partly result of the problems affecting SRNs by World War II. It was also to due to the structural changes in the economy which necessitated the need for non-European SRNs for non-European patients, in the process letting European SRNs concentrate on European patients. During the 1930s and 1940s, the Southern Rhodesia Nursing Services experienced a shortage of SRNs, which affected the smooth functioning of hospitals and nurses’ daily work. This shortage was externally and internally induced. The fact that SRN was a preserve for white women and linked to their contribution to the empire was itself problematic. It was premised on the colony’s ability to recruit enough nurses from the United Kingdom or other parts of the British Empire. However, no matter how vigorously Rhodesia campaigned to recruit settlers, it faced stiff competition from other parts of the empire. Even for settlers already in Africa, Southern Rhodesia usually came second to South Africa as being a preferred destination for settlers. This was the same scenario when it came to recruiting nurses from abroad. 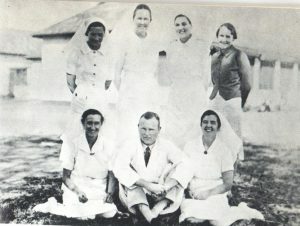 While some nurses came directly from the United Kingdom, the colony also looked to South Africa to find nurses to work in Southern Rhodesian hospitals. Up until 1938, a significant number of white nurses came from South Africa or had passed through South Africa and then settled in Rhodesia. However, by 1939, South Africa also faced a shortage of nurses. Thus, they commenced training African nurses to avert the shortage in their own hospitals. In the same year, South Africa banned medical personnel, especially nurses and doctors, from leaving the country. This policy adversely affected Rhodesian hospitals. Nurses at Fort Victoria, Southern Rhodesia (n.d.). Image via the National Archives of Zimbabwe. The shortage of nurses was also due to the Rhodesian Civil Service’s policy of restricting the permanent employment of married women. In other words, once married, women had to resign from the Civil Service and were expected to become fulltime house wives. They could, of course, be hired on temporary basis. In 1939, half of the nurses who resigned from the Rhodesian Nursing Services did so as a result of marriage. In 1946, of the 19 nurses who resigned, 10 cited marriage as a reason for leaving the Civil Service, while in 1947, 22 of 33 resigned on the same grounds. But this wastage was not only amongst those in permanent employment. It was also rife amongst student nurses. Of the 36 student nurses who completed their studies in 1948, only three ultimately joined the permanent staff. While some went abroad for further studies, reports indicate that majority of student nurses married soon after receiving their qualifications. World War II worsened the situation for the hospitals and, in extension, nurses. As part of its war efforts, Rhodesia established the Military Nursing Services and transferred at least 22 nurses from general nursing services and towards military nursing. This meant more work for those who remained in the Rhodesian Nursing Services. Southern Rhodesia also hosted British airmen, which further stretched nursing services in the colony. At Gwelo Hospital, where a significant number of airmen were stationed, there was an increase of both inpatients and outpatients without a corresponding increase of nursing staff. During the period between 1939 and 1945, it was reported that a single nurse had to attended an average of 20 patients per night. Extending a process which began in the 1930s, World War II also increased the rate of urbanisation amongst Africans. The colony’s change in fortunes during the war, especially the accelerated rate of industrialisation, also meant a need to improve the health facilities for Africans. However, in order to provide better medical services, there was a need for more medical personnel, especially nurses. Hence, further pressure was exerted at nurses were already failing to cope with patients. Indeed, African urbanisation stretched medical and nursing resources and working conditions in hospitals, which further frustrated white nurses. These nurses were not the passive victims of their situation. They responded in various ways and tried by all means to influence nursing policy in Rhodesia. While some nurses were forced to resign as a result of the marriage policy, records also indicate that other resignations were due to frustration with the pressure of working in clinical spaces. Through the nurses’ association, they wrote letters to authorities imploring to them to improve the conditions. And, when given the opportunity, they also participated in publics debates, voicing their opinions on what the government had to do in order to redress the situation. A good example was nurses’ participation in providing evidence, oral and written, on their working conditions and frustrations to the 1945 National Health Services Commission. Nurses requested, amongst other things, that the government introduce pre-nursing courses in schools so as to attract more young women into the profession. They also requested that the government reduce the age of entry into nursing from 18 years to 17 ½ years, and increase the maximum entry age to 30 years. Furthermore, they pushed for adjustments in entry requirements, from having a four-year to a three-year secondary education. One significant contribution these women made was to continue piling pressure on the need to start training non-European SRNs. This would free them to concentrate on white patients and, in the process, lighten their professional burdens. Of course, these debates had begun in the 1930s, but the calls were louder by the 1940s. Even so, it took another decade for the government to begin training African nurses in 1958. While these African nurses were to become the principal health workers in Rhodesian African hospitals during the 1960s, the seeds for change were sown in the 1940s. Working in Southern Rhodesian hospitals during the 1930s and 1940s was a tall order for white nurses. Not only did the Southern Rhodesian Nursing Services have to contend with a shortage of nurses, but those who remained in the profession had to cope with increased workloads, low salaries and numerous frustrations. Time after time, their seniors implored authorities to make hospital work more attractive to women. Examining the experiences of the white women who worked as nurses in Rhodesian hospitals offers a new way to explore the experiences of white women working in colonial public service. It allows us to consider how, as working women, they helped shape colonial policies. For full article, see: Clement Masakure, “‘One of the most serious problem confronting us at present’: Nurses and government hospitals in Southern Rhodesia, 1930s to 1950,” Historia 60, 2, (2015): 109-131. Clement Masakure is a Postdoctoral Research Fellow in the International Studies Group at the University of the Free State, South Africa. His research focuses on the histories of hospitals, health and healing in Central and Southern Africa. He is currently working on nursing history in twentieth-century Zimbabwe.